Are you plagued by misaligned teeth? You may find that maintaining oral hygiene is a challenge, that your bite is uncomfortable, and that you hold back from smiling in social situations. Seeking orthodontic treatment could dramatically increase your confidence and spare you from painful dental issues. At Family Dental Practice of Newington, we’re proud to offer a discreet and efficient way to correct orthodontic problems — Invisalign. 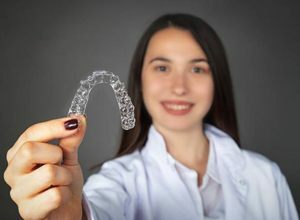 Invisalign is cosmetic and oral health-promoting treatment that uses a series of clear, thermoplastic aligners to apply gentle, sustained pressure to the teeth. You wear each aligner for 20 – 22 hours each day for about two weeks, and as you graduate from one aligner to the next, your teeth slowly move into their ideal positions. 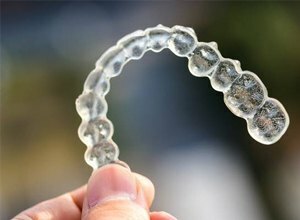 After you finish using all of your aligners, a retainer helps you keep your smile looking and feeling its best. The Invisalign process begins when you visit us for a consultation. One of our dentists will evaluate your smile’s alignment problems. Both Dr. Lim, our on-staff orthodontist in Newington, and Dr. Fink are qualified to offer Invisalign. Then, your dentist will recommend a treatment plan that fits your circumstances. If Invisalign is right for you, we can get to work on designing and ordering your aligner trays. Throughout the course of your treatment, you’ll need to visit us for periodic checkups. 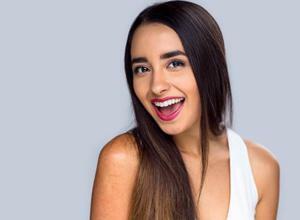 The aligners are extremely discreet, allowing you to maintain a professional image. Many people may not even notice that you’re wearing them. Since the aligners are removable, you won’t have to navigate around any hardware when you’re brushing and flossing your teeth. The removable nature of the aligners allows you to eat and drink all of your favorite goodies, including foods that regular braces would bar you from enjoying. The aligners are relatively comfortable since there are no metal bits that might irritate your lips or cheeks. Invisalign is suitable for addressing a range of mild to moderate orthodontic problems, including crooked teeth, small gaps between the teeth, and occlusion (bite) issues. Both teenagers and adults may be candidates for this treatment. You may begin to see results in as little as a few months. The average overall treatment time with Invisalign in Newington is one year. The cost of Invisalign is generally in the same ballpark as that of traditional braces. The exact price of your treatment will depend on how many aligners you need and whether you need any special attachments for them. Many dental insurance plans offer some coverage for orthodontic treatments, including Invisalign. We can also work with you to arrange a payment plan. Are you ready to discover whether Invisalign is right for you? Contact us today to learn more about this amazing treatment or to schedule your consultation.